Samsung Electronics has announced the appointment of cricketing icon Shahid Afridi as its new Brand Ambassador. This announcement was made at a press conference held by Samsung at a Country Club in Lahore. Shahid Afridi will be engaged in various media activities and events to promote the latest electronic appliances and cellular devices from Samsung. Afridi enjoys an international fan following, including millions of young active fans and sports enthusiasts, who aspire to use trendy new devices and appliances in their daily lives. Similarly, Samsung is perceived as a successful modern and stylish brand globally. 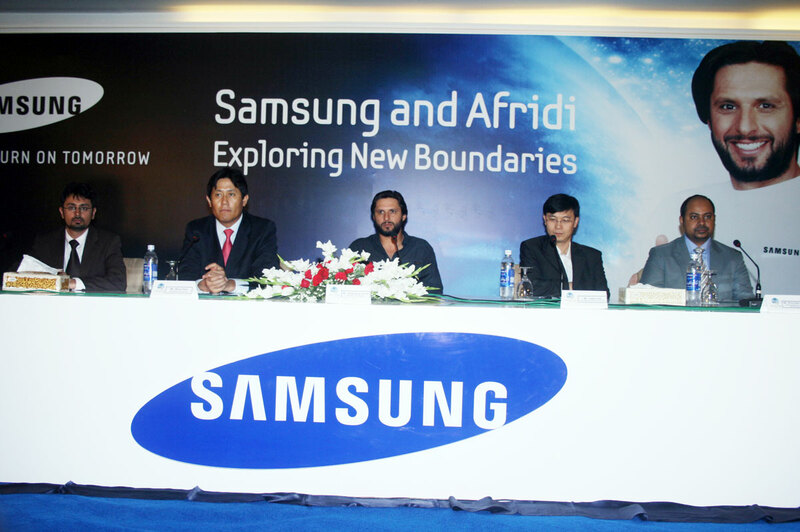 Therefore, Afridi’s sporting personality and trendy attitude truly complements the Samsung brand concept. The General Manager, Samsung Pakistan, Mr. Steve Han, expressed his anticipation for a dynamic association with this leading cricket star and said, “Samsung is a youthful, active and high-spirited player in the electronics industry, just like the robust Cricketer Shahid Afridi. Together these two iconic players will take fresh initiatives, to win the hearts of all progressive consumers”. Shahid Afridi appreciated this new status of being Samsung’s Brand Ambassador and said, “It is a pleasure for me to represent a global leader in electronics. Samsung has always inspired me with its fantastic products. Just like the game of cricket, the technology arena is also very competitive, where Samsung has always showed great performance, determination and innovation”. The truly innovative Samsung products and services – like revolutionary 3D TVs, cutting-edge smart-phones, and an endless store of “Samsung Apps”, reflect the technological advancement of Samsung. Through such evolution, Samsung continues to be among the “World’s most admired companies” of the Fortune magazine. Samsung made a wrong choice i guess…. how much boost did afridi give to sales when he was with Pepsi or P&G?